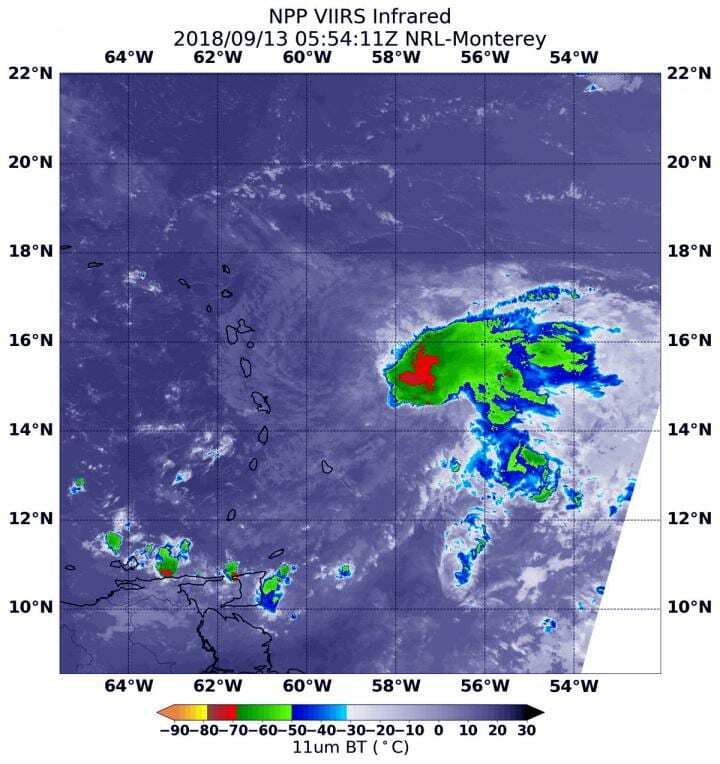 Wind shear seems to be affecting several storms in the Atlantic Ocean today, Sept. 13, 2018. Wind shear is affecting Hurricane Helene in the Eastern Atlantic and in the Western Atlantic, Hurricane Florence and even Tropical Storm Isaac are feeling its effects. NASA-NOAA's Suomi NPP satellite provided an infrared look at Tropical Storm Isaac that revealed its circulation center was displaced from the bulk of clouds and precipitation. That's an indication that wind shear is affecting the storm. What is Vertical Wind Shear? In general, wind shear is a measure of how the speed and direction of winds change with altitude. In order to understand how it affects a tropical cyclone or hurricane, think of a tropical cyclone as a series of vertically stacked tires, all rotating. As you go up from the ground, each tire represents the rotation of the storm's center at a higher level in the atmosphere. The different levels of rotating winds in the center of tropical cyclones need to be stacked on top each other to strengthen. If there are winds higher up that push some of the tires askew near the top, it affects the balance and rotation of the tires below. That's what happens when vertical wind shear pushes against a storm. It pushes the center and weakens (or wobbles) the rotation of all of the tires. The National Hurricane Center or NHC noted "Satellite imagery indicate that Isaac remains a poorly organized tropical cyclone, with the low-level center mostly exposed during the early morning hours." Isaac is being battered by strong vertical wind shear. At 1:54 a.m. EDT (0554 UTC) on Sept. 13, the Visible Infrared Imaging Radiometer Suite (VIIRS) instrument aboard NASA-NOAA's Suomi NPP satellite analyzed Tropical Storm Isaac in infrared light. VIIRS found a small area of coldest cloud top temperatures off-center were as cold as or colder than minus 70 degrees Fahrenheit (minus 56.6 degrees Celsius). At 8 a.m. EDT (1200 UTC) radiosonde data from the eastern Caribbean and NOAA Hurricane Hunter aircraft data indicate that the circulation of Isaac is fairly shallow and small. It is entirely possible that Isaac will degenerate into a tropical wave during the next day or two due to the continued effects of strong wind shear. A Tropical Storm Warning is in effect for Martinique, Dominica and Guadeloupe. Tropical Storm Watch is in effect for Antigua, Barbuda, Montserrat, St. Kitts and Nevis, Saba and St. Eustatius, St. Martin and St. Maarten. At 8 a.m. EDT (1200 UTC), the center of Tropical Storm Isaac was located near latitude 15.2 degrees north and longitude 60.9 degrees west. Isaac is moving faster toward the west near 21 mph (33 km/h). This general motion is forecast to continue today with a decrease in forward speed over the Caribbean Sea. Maximum sustained winds remain near 45 mph (75 kph) with higher gusts. Little change in strength is expected over the next several hours as Isaac moves through the Leeward Islands. Gradual weakening is forecast after that as Isaac moves through the eastern Caribbean. NHC said Tropical Storm Isaac is expected to produce total rainfall accumulations of 2 to 4 inches with isolated amounts up to 6 inches across Martinique, Dominica, and Guadeloupe, especially over elevated terrain. Rainfall of 0.5 to 1.5 inches with isolated amounts to 3 inches are forecast across Puerto Rico and the southern United States Virgin Islands, with up to an inch anticipated across the remaining Windward and Leeward Islands. This rainfall may cause dangerous flash flooding. NHC said on the forecast track, Isaac should move across the central Lesser Antilles and into the eastern Caribbean Sea later today, and then move across the eastern and central Caribbean Sea through the weekend.